A fun blog about everything that has to do with nails and nailart! Today I will continue with the 30 days nail art challenge. As I’m back from Paris and in the middle of my autumn brake, I’m planning to do lots and lots of nail art these upcoming days! But for now, without any further ado I will go on to the nail art of day 16. 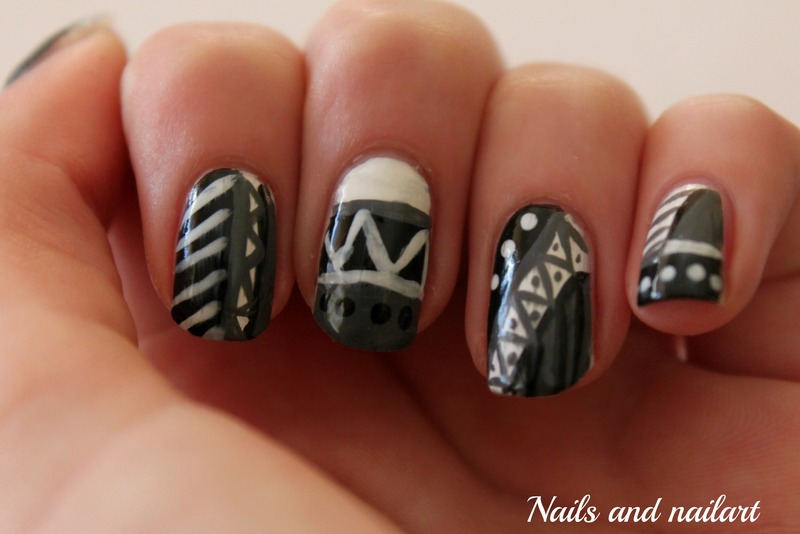 The challenge for today was to make a tribal print nail art, and as you might know I did this before! In this post I showed you the orange tribal nails I created. This time I chose completely different colors: black, white and grey. I used the polish nr. 59 Black is back from Essence, my brand less white and a mixture of the two to create the grey. The overall nail art turned out to be quite dark, which is something I would probably change if I’d recreate this nail art. Furthermore I think it looks fine, and I hope you like it. Below is the second picture of the nail art, and I’ll see you soon!